Do you need a foundation brush? The foundation brush. It’s not new to the makeup world and you know that almost every makeup counter you go to will try to sell you one. It claims to make foundation application easy and smooth but do you really need it? Truthfully, I go back and forth with foundation brushes. Sometimes I need them and use them daily, and then I go through a phase where I use my fingers, and then I turn to Beauty Blenders… I’ve found the foundation brushes and Beauty Blenders give the smoothest finishes up close so… that’s the way I’m going right now. From what I’ve seen, foundation brushes are more or less the same. The only difference that they may have is in their sizes so whichever you pick, just make sure that it’s from a reputable line so that the bristles don’t fall out before you’re done using the brush. The brush does have some advantages over a sponge. It doesn’t absorb any foundation and that means that you’ll waste less product. I find that even a wet Beauty Blender absorbs a lot of foundation especially if it’s runny. You just have to wash the sponge out to see! 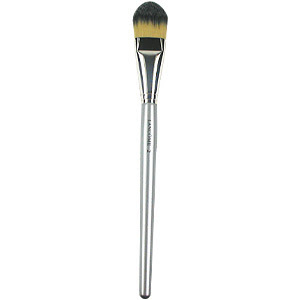 The tapered shape of the brush also gives you more control than a sponge might. That said, I am finding that the brush is easier to use with liquid foundations than with creams. The powder finish of my cream foundation means that the brush puts on more product than I like and I have to spend more time blending it out. When I use the brush with a liquid, I really feel as if I am painting my face with foundation and I’m not sure how much I like that feeling. More often than not, I get medium coverage instead of sheer (which I prefer) and I feel like it takes more work to get the product into the contours properly. So, the foundation brush, is it worth the hype? Yes and no. It’s not perfect, but you waste less product and for that reason I’ll be using my brush instead of putting it away. Accessories, Foundation, Lancome, Worth the Hype? ← What Kind of Exfoliant Do You Use?